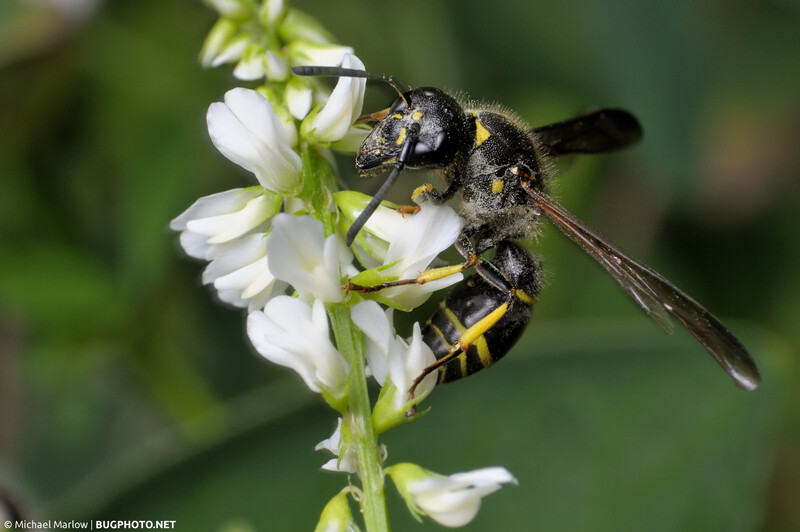 A potter wasp (subfamily Eumeninae) hastily bounces onto some white flowers. Well, as you can see if you’ve been following along, The BugPhoto Guide series is temporarily suspended; hopefully just for today and the weekend. I ran out of time and energy for my next post, which will feature some video of me shooting, as well as some shots and video showing the different working distances of the reverse lens. Disclaimer: it’s not great video, so let me lower your expectations there, but hopefully it will be useful. After that I have a handful of more articles I’d like to write. Here’s hoping for a productive weekend. In the meanwhile, I offer you this shot of a potter wasp (subfamily Eumeninae). These wasps are magnificent specimens, often imposing in their appearance but also in my experience not too camera shy. As far as wasps go, anyway. This one was in a bit of a hurry if memory serves; perhaps feeding on the flowers or maybe more likely looking for caterpillars to feed to the young. The photo shows the result of its rough haste: some fringing or motion blur, especially around the mid to lower white petals on the left and the antennae and wings of the wasp. Usually that kind of thing makes me itch, but for some reason I really like this shot; I didn’t even really consider trying to edit the fringing out. (Usually, it is something I consider then realize I’m woefully incapable of editing out.) What I did consider and eventually do was make a black and white version (below). Not my usual thing, but I’ve been noticing more black and white in my daily photo viewings so maybe I was subconsciously inspired. After futzing with the contrast and brightness a bit, I was a little itchy over some of the more blown out white petals, but I decided in favor of sleep. (It was a good decision for me, if not the photo.) Have a great weekend. everyone! Posted in WaspsTagged B&W, black and white, contrast, Eumeninae, Macro Photography, monochrome, potter waspBookmark the permalink. Dang, I’m going to have to wait through the whole weekend now. Good shot of the wasp…my son-in-law was really impressed.